Deficiencies of these minerals can contribute to nervous tension, an inability to relax, and more difficulty in getting a good night's sleep. Tart cherry (also known as Prunus cerasus) has been used by healers and physicians for hundreds of years. Europeans in the 15th and 16th century kept a "confection box" (confection: a medicinal preparation of seeds, spices, and herbs mixed with sugar, syrup or honey). Among the contents of these boxes were cherry seeds. Passion flower is widely used by herbalists and natural health practitioners around the world. Passionflower contains active ingredients that help to relieve anxiety, relax and calm the individual. This acts to reduce day-to-day stress that can often make it harder to get a good night's sleep. 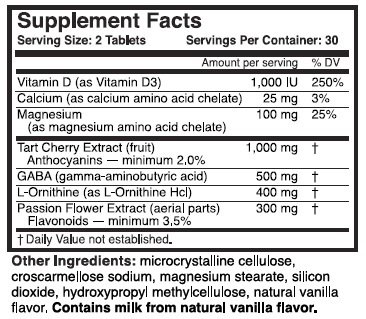 Each of these safe non-habit forming ingredients support physical relaxation and calmness. Combined, they create a very effective way for you to experience a restful night's sleep that can be safely used as often as needed. We're so sure about the quality and effectiveness of the RHP® Sleep Support Formula, and that you will experience the results you want, that we offer a 90-day money-back guarantee. 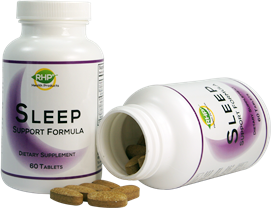 Order the RHP® Sleep Support Formula Now!